You will not believe the Nano 180 freshwater tank! 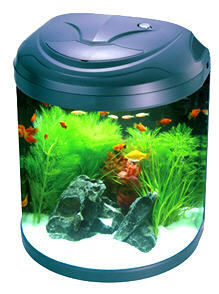 JBJ introduces its plug-n-play 8 gallon freshwater modern aquarium. This beautiful glass aquarium offers 180 degrees of panoramic viewing with a flat back wall for fitting in restrictive areas. 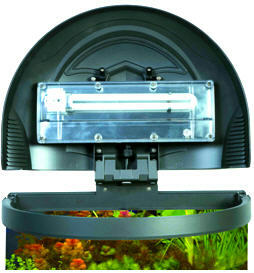 This Half Moon aquarium kit includes an integrated 3-stage top filter with mechanical filter floss, activated carbon basket, ceramic ring basket, designated heater slot, and integrated pump (77 gph) that turns the aquarium over 9x an hour for a sparkling clean showroom display. The patented hinge canopy easily opens and allows for two Nano 180° half moon aquariums to be set up back to back for an eye catching 360 degree presentation. All canopy hoods contain an energy efficient 11 watt daylight (CF) lamp and UL Listed electronic ballast housed within an o-ring sealed splash guard. Routine maintenance is simplified with a quick opening of the canopy lid with full access to the top filter, pump, and heater (not included). 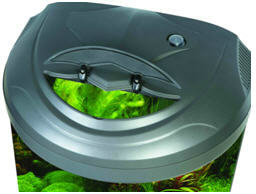 Feeding lid grants easy access for daily feedings without having to raise the entire canopy. A moisture proof ON/OFF switch is conveniently located on top of the canopy for power control of the lighting system. The Nano 180° offers an innovative 3-Stage filtration system that is above the water line to maximize internal space for livestock and decorations. You can easily perform filter changes within seconds with virtually no water contact! Water is pumped into an adjustable spray bar and is directed over our mechanical fine filter floss to pick up debris and free floating matter. The filtered water then drips over and through 2 media baskets that contain activated carbon and our biological ceramic rings. Your filtration system also includes a designated heater slot for easy placement. JBJ has done it again with the all glass Nano 180 aquarium.